During a walk in the countryside one of the most frequent questions asked when passing a cornfield is “What type of grain is growing here?” The easiest crop to identify is Common Oat, which reaches a height of up to one metre and has seed heads quite different to those of wheat, rye or barley. Common Oat is a cultivated plant belonging to the panicle-forming grasses. This means that its grains do not grow in compact ears, like wheat, but are loosely grouped at the tip of the stem, where they blow in the wind. Little spikelets of two to four florets are attached by short stems to the loose panicles. 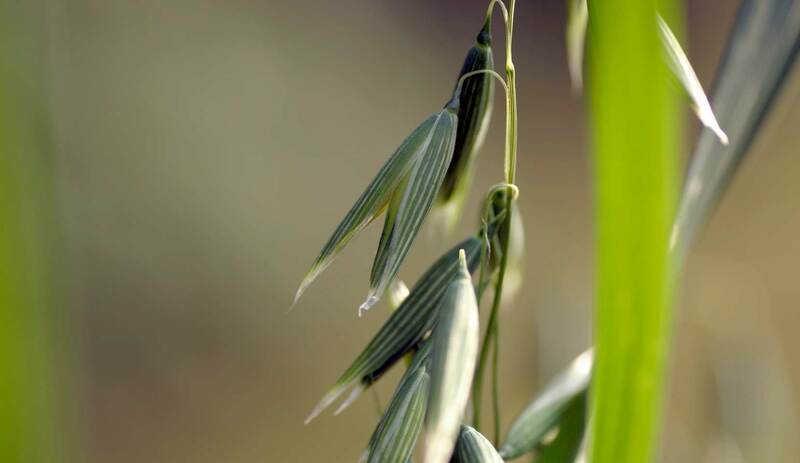 The oat grains develop from the self-pollinating flowers which blossom between June and August, and are loosely enclosed by two firm, pointed bracts known as glumes. A widely branching network of roots allows the undemanding oat to grow in poor soils. Oats are rich in protein and have traditionally been used as a fortifying food for the infirm or as a dietetic food for those with nutritional disorders. An infusion of oat straw has proved beneficial for nervous exhaustion or insomnia and as a nerve tonic. In homeopathic medicine, oat preparations are used to treat nervous exhaustion accompanied by lack of appetite, insomnia and lack of concentration caused by worrying and palpitations. A tea made from green oat herb harvested shortly before full bloom is used for nervous exhaustion, insomnia and weak nerves. It is thought to lower the levels of uric acid in the blood and thus be useful in the treatment of gout and rheumatism. It is also used for irrigation therapy. The scientific name Avena probably derives from the Sanskrit word avasa = foodstuff. The epithet sativa is Latin and means cultivated – referring to the fact that Common Oat is a purely cultivated crop. It is the result of crossing the wild species Wild Oat (Avena fatua), Winter Wild Oat (Avena sterilis) and Slender Oat (Avena barbata). was placed on the bridal table for guests to throw oat grains into. If they sank this was regarded as a bad omen for the marriage. Oats are among the most nutritious cereals in Central Europe: in addition to their high protein content (12 percent) they contain many vitamins, especially B-complex vitamins, and minerals. Oatmeal cannot be used for baking, because it contains too little gluten. Rolled oats, porridge and oat milk do enjoy widespread popularity, but by far the greatest amount of the oats produced is fed to horses, cattle and chickens. Oats have an affinity with both air and water. Of all our native cereals they need most water to thrive. Their inflorescences, in contrast, are the most airy in form. The propensity of the oat for binding these two elements together is apparent from its saponin content. Saponins form a soapy foam when shaken in water. One could say they combine air with water. If the rhythm of binding and releasing which takes place between the mental and the physical in the human organism is disturbed this can lead to insomnia. In such cases, oats have a regulating effect. Dr.Hauschka Soothing Cleansing Milk contains an extract of oats, wheat and rye. This lacto-fermented extract is rich in enzymes and minerals and is beneficial to cleansed skin. Lactic acid is a component of the natural hydrating factor of the skin.